Virudhunagar is heading for one of it’s important election which will go down in it’s history. In the past prominent people have been chairman. All of them were under political parties. Being a prominent person in the locality it was not difficult to win. These chairmans did not perform anything comment-able but at-least things were not worsening. Problems persisted – water, bus, hygiene but promise we had roads in Virudhunagar long long ago. Five years ago the chairman elected in an unconstitutional way (elected by Councillors). Mrs. Karthiga Karikol became the chairman. Since then Virudhunagar needs to be visited to say -” life is pathetic ” may be this is a understatement. Roads we had seen it 5 yrs ago. Drinking Water, Transport, Hygiene all just dropped like a free fall. This municipality under her was Congress party’s. Like never before it fell into the clutches of KKSSR ( VNR well wisher – just joking) an Ex MLA from DMK. Looting- dmk, admk & congress just showed unity. The biggest scandal in VNR- Under Water Sewage Scheme. 5yrs No road, project is still going on, it’s not functioning either, health aftermaths- hoof its just pain. In 2009 March “FOR – VNR” was started by youngsters with a adrenaline gush and created some sensation in town. Most of us were living away so its just a start and then Seniors took it over and started “Nagar Nalla Amipu” as the name suggests it worked for the improvement of VNR. It was not to a religion or a caste. It had all on board. For the past 3 yrs it’s been active in questioning the issue through RTI & PIL. It had major public support in the Bandh opposing the municipality in 2009 & during the attempt to arrest it’s member in a false police case in 2011. Honestly Kamaraj would not have entered politics if it’s today. He was a freedom fighter not a politician. So we the son of this great place of Kamaraj have to make it count. No to politicians. “FOR-VNR” takes pride in setting the ball roll. 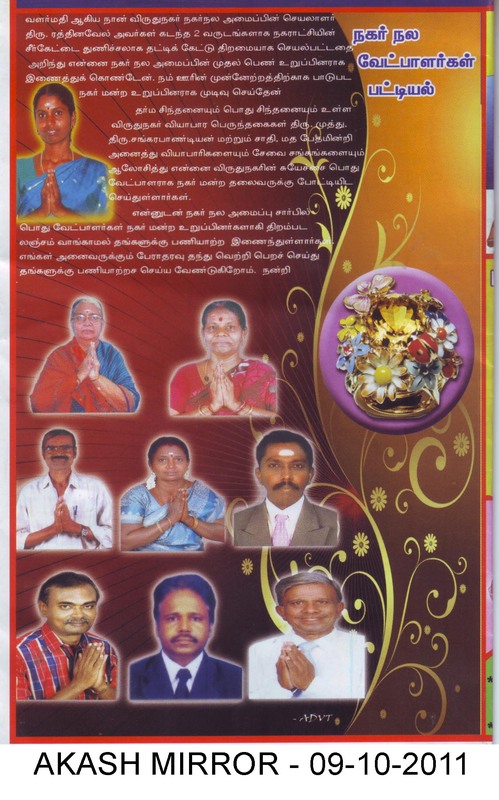 This entry was posted on October 6, 2011 at 6:44 pm and is filed under FOR, Virudhunagar, VNA. You can follow any responses to this entry through the RSS 2.0 feed. You can leave a response, or trackback from your own site. But why is this article mocking DMK party?? Bro, guess u got wrong ! Lets not target any parties?? Just that ! congress & dmk have a big part in today’s virudhunagar. its there to be seen. 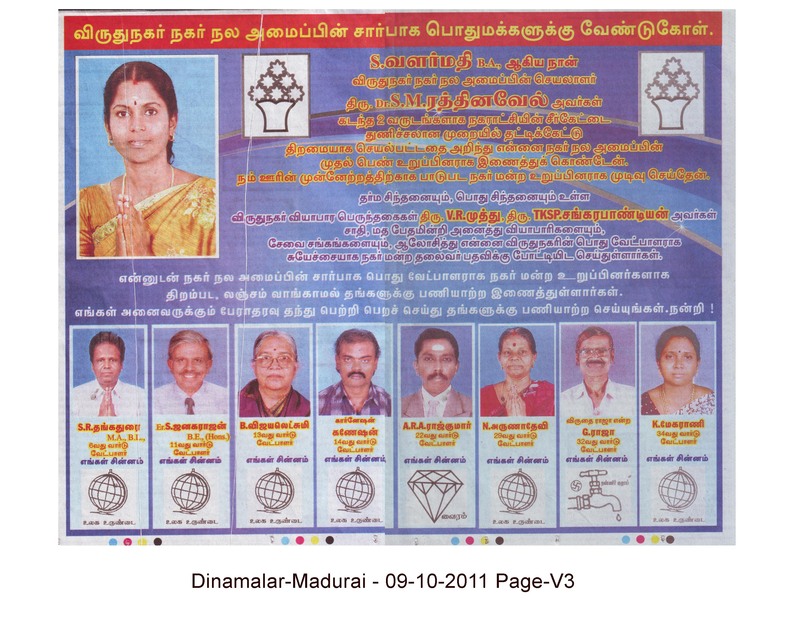 congrates valar mathi.do something good in vnr. just contested… result yet to be out..